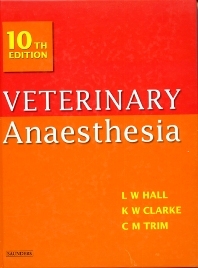 This essential text covers the latest information on anesthesia and analgesia in large and small animal species. The new edition has been extensively revised and contains greatly expanded sections on anaesthesia of exotic species, anesthesia in obstetrics, accidents, and crisis, and also a new section on anaesthesia of wild animals and birds. Hundreds of illustrations and a glossary of USA and UK drug names enhance the comprehensive text, and make the new edition of Veterinary Anaesthesia an essential purchase for all vets!